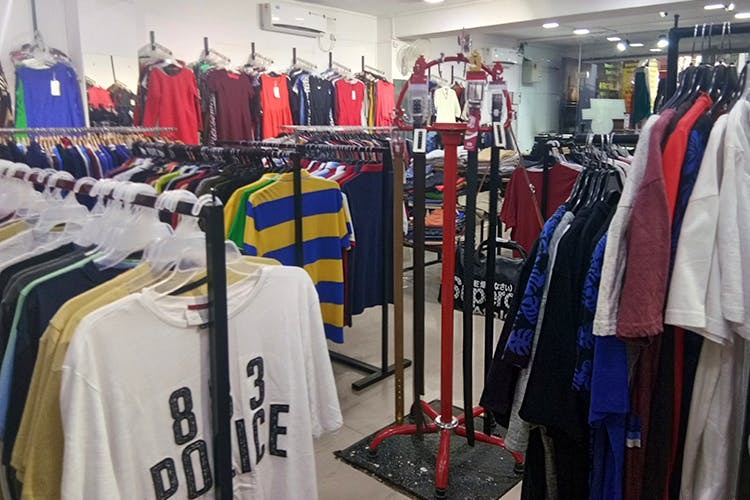 Snap up all the coolest high street and designer brands for throwaway prices at Route 77 in Kalyan Nagar. Vero Moda, Diesel, Zara Men, and Mango are all part of the fashion parade. Embracing a new look? Then, a swing by Kalyan Nagar is well-warranted. Located right below Truffles, Route 77 is sure to supply you with a year’s (if not more) worth of clothes. The export surplus store has a great mix of familiar brands like Allen Solly as well as a handful of high-end ones. You can pick from a lineup of tops from the likes of Vero Moda, Allen Solly, Van Heusen, and ONLY. These are perfect for work or for casual wear. Prices here begin at INR 549. They also have simple sheath and panel dresses. Route 77 is one of those rare, surplus stores that offers plenty for men. We spotted an entire rack of fashionable shirts from Zara Men and Mango (INR 899 upwards). They have an array of the trousers from Boss and denims too. Gym wear too is part of the selection and you can pick up shorts from Nike for INR 549. We also spotted some really stylish gym, duffel bags from Super Dry at a little more than INR 1k. Their tops, for women, are on the plain side so if you are looking for something super stylish, you might be disappointed.